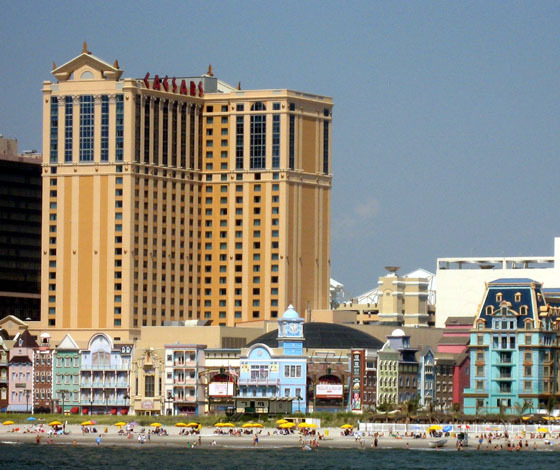 Caesars Atlantic City Hotel Casino is located at 2100 Pacific Ave., at the Boardwalk. This location provides easy access to Atlantic City's famous boardwalk, and outstanding views of the beach and Atlantic Ocean. It connects to the Playground across the boardwalk. 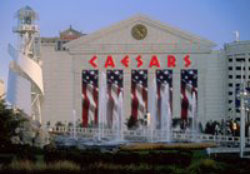 The Caesars casino in Atlantic City incorporates a Roman theme as evidenced by the imported colonnades at its entrance. 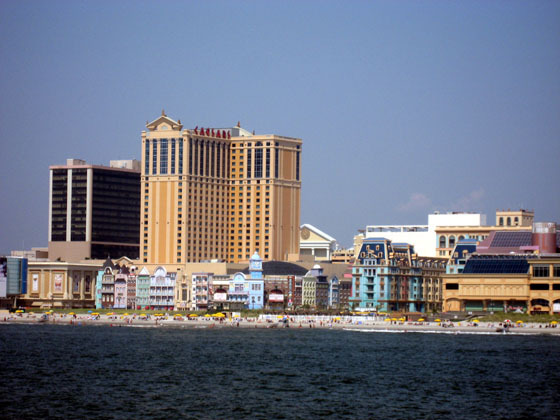 Caesars Entertainment Corporation, which is the world's largest provider of casino entertainment, owns three casinos in Atlantic City, one of which is "Caesars." The casino has a new modern and expaned buffet called "The Palace Court Baffet." 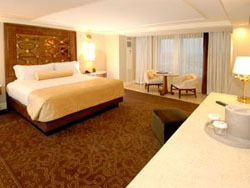 Caesars has renovated and upgraded 850 luxury and premium rooms in their Centurion and Ocean Towers. 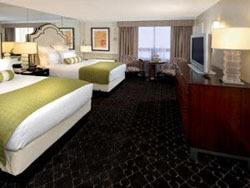 These rooms offer a new extravagent interior design, new furnishings, luxury mattresses and outstanding views of the Atlantic City skyline and beach and ocean. The rooms also include large flat-screen televisions with surround sound and spa-inspired bathrooms that feature a television built into the vanity mirror. There are 145,000 sq. ft. of gaming space, and 2,100 slot machines at Caesars. 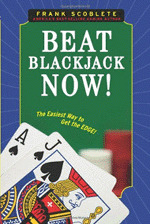 Its casino's games include Slots, Poker, Blackjack, Roulette, Craps, Baccarat, Mini Baccarat, and Spanish 21. 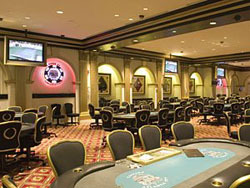 Caesar's poker room has 24 gaming tables. The casino's Asian Area, Palace East featuring 28 gaming tables, is designed to bring good luck and fortune to players. 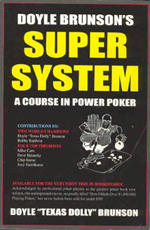 Its games include Pai Gow Tiles and EZ PAI Gow. They also have the Gordon Ramsay Pub & Grill, the Cafe Roma, Kiwi Noodle House, Tazza and the Palace Court Buffet. The KWI Noodle House features both traditional and modern Asian cuisine. It is located adjacent to the Palace East Asian gaming area. 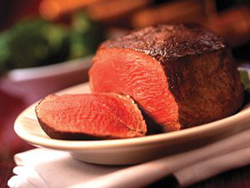 Morton's Steakhouse features prime aged beef. 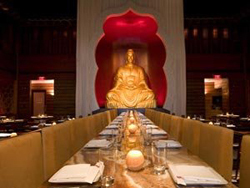 The Playground at Caesars includes numerous additional restaurants including: Buddakan at the Playground, Continental at the Playground, and Phillips Seafood. Dusk is a new upscale nightclub at Caesars. Toga Bar is Atlantic City's premier social destination. DJs and dancers perform nightly. The Backyard Bar is an indoor/outdoor bar and restaurant featuring signature cocktails, frozen drinks, and your favorite summer food fare. Some of the hottest and most popular entertainers perform at Caesars 1,500 seat Circus Maximus Theater. Caesars Salon offers cuts, styles, colors, up-dos, perms and other hair services. Also professional makeup applications, bridal services, airbrush tanning and eyelash enhancements. 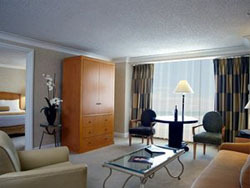 Hotel accommodations include Deluxe Rooms, Luxury Rooms, Premium Rooms and Suites. 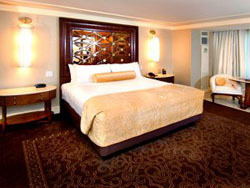 There are a total of 1,400 guest rooms. The Playground Pier complex is connected to Caesars with a bridge from the 2nd floor over the Boardwalk. The Playground has about 75 shops and restaurants from which to choose. Caesars has a large multi-level parking garage. Casino Map - You can find Caesars using this map. More photos of Caesars are shown below. Caesars Atlantic City. Portions of Bally's Wild Wild West can be seen in the foreground. © Copyright 2007 - 2014. All Rights Reserved. Advanced Systems.